This autumn, when my husband and I were traveling in Quebec, I learned that the largest Retrospective Exhibit of J.W.W. Waterhouse’s work was going to shown at the Montreal Musee des Beaux-Arts from October to February 7. I decided that I HAD TO GO! 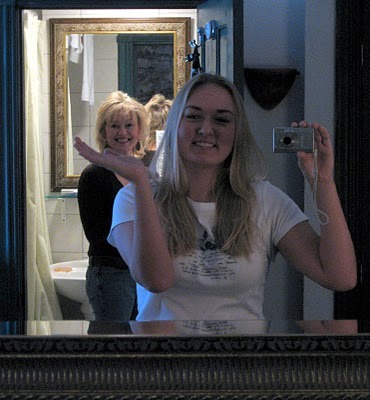 I had already purchased tickets for myself and my daughter, Iphigeneia, when we learned that my husband had lung cancer. The trip was up in the air and looked likely to be canceled, as pursuing treatment for the cancer was of paramount and immediate importance. We thought initially, that surgery would be performed, but as it has turned out, we are going through chemo instead. Matt and I discussed it, and he felt we should go to Montreal. His treatment may be more difficult as time goes on, and his brother Mike and good friend Randy were willing to come and stay,….so we went. The photograph above is one that Geneia snapped on Friday, after we had spent noon and afternoon in the Exhibit. Josee met us in the Museum and we went out for coffee at a Patisserie nearby. 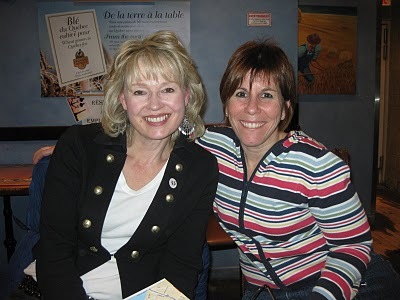 We very much enjoyed meeting her in person and visitng about our travels, hers and ours. Merci, Josee! J ‘espere que nous nous reunissons encore! G and I in our room kidding around. Below, in one Blog entry after another, I’m posting all the major paintings we saw, together with literary references and personal comments. 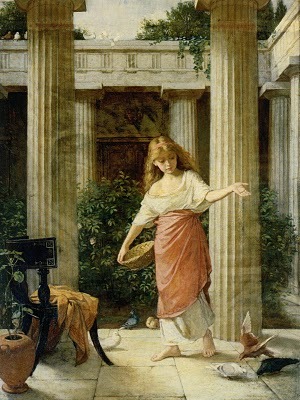 As a young painter, Waterhouse, like other artists of his era, notably Lawrence Alma Tadema, was inspired by the excavations at Pompei to try to recapture the scenes of daily life in that lost and foreign world. ‘In the Peristyle’ is painted over a previous work, which one can see evidence of through the paint. Preraphaelites, like William Holman Hunt and John Everett Millais, has already painted scenes from Shakespeare’s plays as readily as historical scenes. 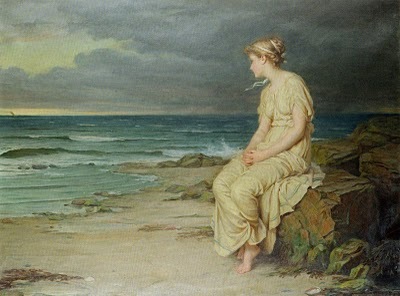 This is Waterhouse’s debut with a Shakespearean subject from The Tempest. He will later return to this heroine, with a less restrained painting style. I find it very initresetng to think about how the Pre-Raphs are inspiring modern dressing. I hope to see more rich colors and draping on the catwalks. It surprises me not at all that Diane von Furstenberg would be inspired by them, since she’s known for her flowy, floral designs, and her interest in how fabric moves on the body. Also thanks for showing a couple of paintings there, that I hadn’t ever seen, Hesperus and Luna. Luna particularly, what a lovely piece. Seven years ago, there was an exhibit at the National Gallery in London called Fabric of Vision (I believe) and it was all about the depiction of fabric and drapery in art. I’m always amazed at how artists can manage to depict the sheen of a satin skirt or the nap of a velvet dress. One of my favorite painters of fabric is Ingres, and Paul Delaroche’s painting of the Execution of Lady Jane Grey has one of the most beautiful depictions of white satin ever. It serves the subject well, since the skirt is worn by the tragic young queen, and the beauty of it lends even more pathos to the heartbreaking scene.Anyway, just thought I’d put my two cents in. Thanks for the great article!